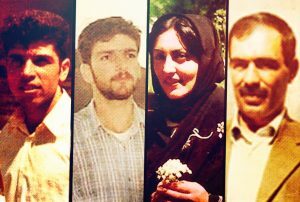 10 October 2018– On this World Day Against the Death Penalty, Justice for Iran is submitting complaints to the UN Working Group on Enforced or Involuntary Disappearances (WGEID), regarding the cases of four Kurdish political prisoners executed in 2010. 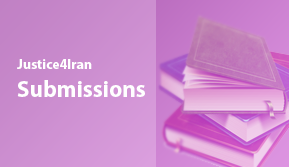 The four complaints address the enforced disappearances of Shirin Alam Holi, Farzad Kamangar, Ali Heidarian and Farhad Vakili. The complaints underline the crimes and impunity of the Islamic Republic’s authorities in never returning the victims’ bodies to their respective families and in continuing to conceal the truth regarding their executions and burials. 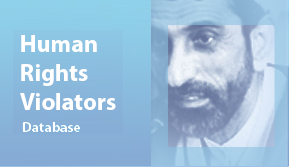 Justice for Iran’s complaints urge the WGEID to address the government’s silence on these crimes. According to the WGEID, the government’s extrajudicial killings, concealment of their executed victims’ fates and whereabouts, and refusal to acknowledge their doing so amount to enforced disappearance. In their complaints, Justice for Iran details the prisoners’ arrests, tortures, prosecutions, and executions at the hands of government authorities, as well as documents the families’ attempts to acquire related information from the government’s uncooperative authorities. In June 2008, Shirin Alam Holi was arrested by the Islamic Republic’s security forces. According to a letter she wrote prior to being executed, Shirin continuously suffered from nightmarish physical and psychological pressures, after being tortured for three weeks by the forces. In 2010, the Islamic Republic announced her execution, prompting her family to travel immediately to Tehran in an attempt to collect her remains from the prison. There, the family was given only a bag containing Shirin’s personal belongings and was told that she had been buried at Behesht-e Zahra Cemetery in Tehran. When the family arrived at the cemetery, they were informed that Shirin’s body had never been delivered to the location for burial. To this day, the Alam Holi family does not know where Shirin in buried and has received neither a death certificate nor any official document proving her execution. 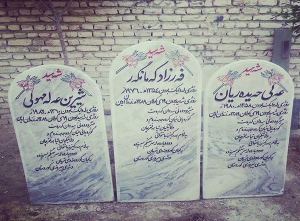 The families made symbolic gravestones for Shirin Alam Holi, Farzad Kamangar, and Ali Heidarian. Farzad Kamangar and Ali Heidarian were arrested together in Tehran in August 2006 and executed by the government in 2010. Their families were also denied their remains and information regarding their burial sites. Farzad, a 45 year-old teacher, was sentenced to death during a trial that lasted about five minutes. When his family attempted to collect his body from Evin’s prison, the authorities told them to first visit the court in order to request Farzad’s body and death certificate. Despite following these instructions, Farzad’s family received no response from the court. Later, the advice of parliamentarians led the family back to their home city of Sanandaj, where they reported to the governor’s office and other official institutions. The Islamic Republic’s authorities never responded to any of the Kamangar family’s requests. When Ali Heidarian’s family tried to inquire about his disappearance, they met with their local governor and were told that the location of his grave could not be disclosed due to security concerns. Farhad Vakili’s family submitted a similar testimony for the complaint. Arrested and tortured by the Islamic Republic;s authorities, Farhad was sentenced to death in February 2007 during a three-minute trial. His family learned of his execution in 2010. Since then, every request they have made to acquire information about his fate and final resting place has been ignored by the Islamic Republic’s authorities. The cases addressed in the complaints to the WGEID are part of a troubling pattern of state oppression against political prisoners. In the most recent cases, the Islamic Republic continued its enforced disappearances of political prisoners by executing three Kurdish political prisoners. Ramin Panahi, Zanyar Moradi, and Loqman Moradi were all executed last month. Government authorities have not returned these victims’ remains to their respective families and continue to conceal the locations of their burial places. The original explicitly states that Farzad’s family has no death certificate and that Ali’s has no proof/evidence of his execution. This seemed to imply that Ali’s family also lacks a death certificate.